Then comes spring and the sea is moving in. 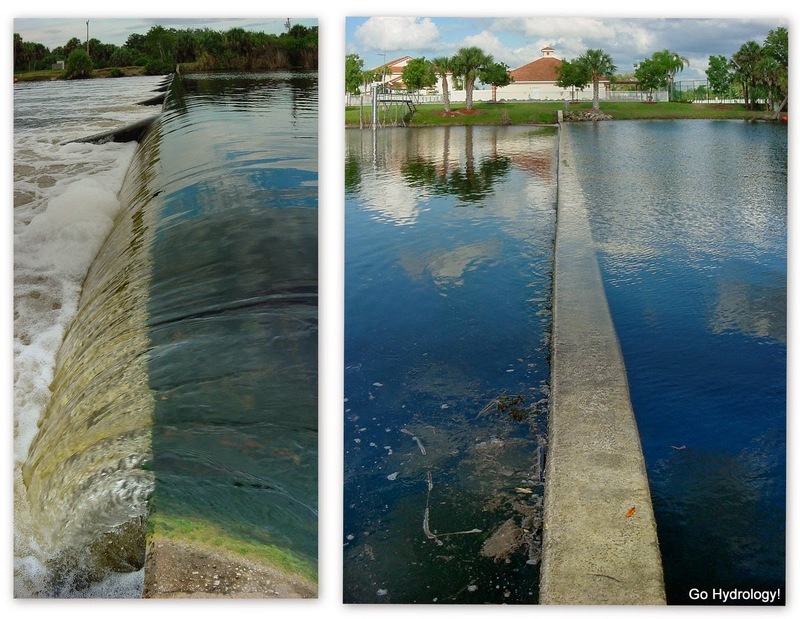 The photo on the left shows water flowing spilling over Weir No. 1 in the Faka Union Canal near Port of the Islands during a high water summer event. The photo on the right (taken from the other side of the canal) shows saltwater creeping over the weir from the left hand (i.e. south) side). The photos above show each condition for the Faka Union Canal. The hydrograph below shows when the photos were taken. The above hydrograph shows the daily flow rate for the Faka Union Canal as measured at Weir No. 1 near Port of the Islands. Daily flow from 2008 to 2014 is indicated by the blue line. The dotted black line indicates the long-term median. The gray band in back indicates the long-term range as calculated from 1993 to present. Flows to the canal will eventually be reduced once the upstream restoration of Picayune Strand is complete. As antsy as I am to see it finally happen -- and updating the photos and hydrograph once the restoration is complete -- I think about the people that pushed for the project as far back in the 1980s. Finally for them the wait is almost done.